PLEASE ASK FOR A QUOTE BEFORE BOOKING since the Instant Quote may well NOT BE ACCURATE because our rates vary considerably depending on the time of year, number of people, etc. ALSO NOTE WE ALMOST ALWAYS RENT BY THE WEEK DURING THE SUMMER and Saturday to Saturday since this works best with our cleaning peoples schedule and since the traffic heading north on Fridays can be heavy -- however, we will consider other times closer to the summer. Also note that since our renters have take good care of the property CLEANING IS INCLUDED IN OUR RATES. Why stay at a rental condo or motel when you can have your own delightful Chalet! 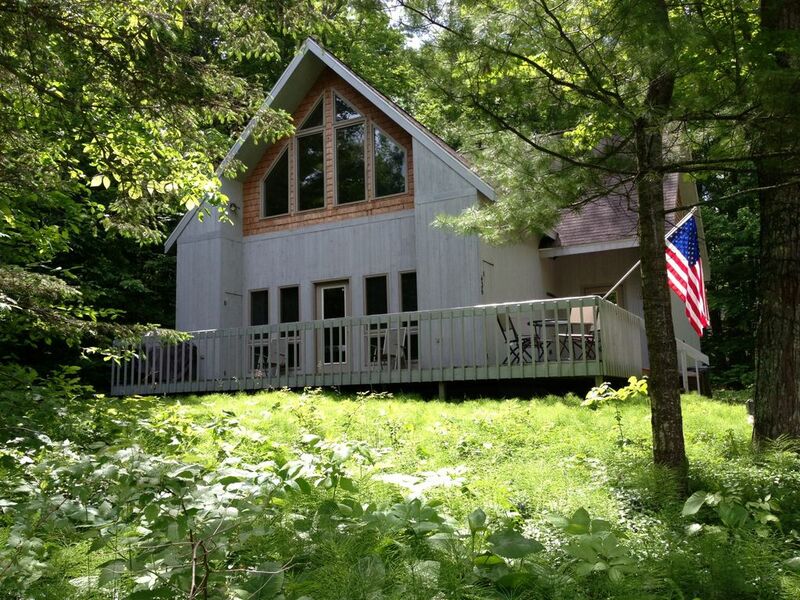 Our newer Chalet has a year-round wooded setting that is very close to the Nubs Nob and Boyne Highlands ski resorts and the world class shopping, beaches, lakes, golf courses, and restaurants in the famous Petoskey-Harbor Springs area. SUMMER and FALL are always 'high season' with the famous Harbor Springs/Good Hart/Cross Village area a few miles north and west, and Petoskey/Bay Harbor & Lake Michigan a few miles south, with many beaches, inland lakes, and great golf courses in-between. And WALK TO NUBS NOB. In WINTER the Chalet's location is exceptional since the Nubs Nob parking lot just one long block away. Nubs was named Ski Magazine's #1 Ski facility in the Midwest for the last 3 years. And if you are not familiar with this wonderful area we have numerous 'insider tips' and recommendations on restaurants and places to see and things to do. The first floor of our spacious Chalet has a great room with a vaulted ceiling and large windows, a dining area with a table that seats 8, a modern fully equipped kitchen, a full bath with tub, a large entry/laundry area, and two good sized bedrooms each with closets and twin beds. The second floor has a comfortable loft area with stereo/TV/VCR/DVD, cable TV, broadband internet with WiFi, a large Master Bedroom (with a queen bed, large closet,vanity & sink,and desk); a fourth bedroom with twin beds and a closet; and a large bath with shower. The Chalet is nicely furnished and decorated and has an Up North warm wood interior with many vaulted ceilings and skylights. The kitchen is fully equipped, the laundry has a full-size washer & dryer, the entry area has ample places for coats and gear, and there is a large front and side deck with a table, chairs and a gas grill. This is not a typical rental property and is only available certain times throughout the year. PLEASE: No Pets and No Smoking. Families, adult groups and longer term guests are preferred. Many return year after year and comments from past guests include: “You represented your chalet perfectly on VRBO. It was exactly as I expected and we had a wonderful time.” D.D. “It was a perfect setup for our family and we would love to do it again.” A.L. 'Awesome chalet!' C.C. 'One of our best family vacations ever!' L.B. 'What a wonderful time we had in your beautiful and accommodating chalet' C.W. 'Thank you... We had a wonderful time. It is the perfect family spot.' J.B. 'We are use to being pampered and this chalet is perfect.' J.L. I was born in the area and spent 60+ years as a summer person. Now we spend over half the year Up North. Since this is the only property we occasionally rent we cannot operate like the larger rental groups that have full time cleaning people, etc. As a result it may take a day or so to confirm our cleaning people's schedule. Sorry. When our children were younger we all skied at Nubs Nob and the kids could walk back to the Chalet when they were tired or the slopes were crowded. And in the other seasons it has a secluded wooded setting but is still close to everything. While fairly new with vaulted ceilings, the wood walls give the Chalet a warm Up North feeling. This is not a typical 'rental' property. Up bath with shower and down with shower/tub. See snow making at Nubs from the master bedroom skylight in the winter. One in loft and a second in the Master Bedroom. Our own Insider's Guide to the area is provided with lots of information on things to do and see, and where to eat... and hidden gems. In winter walk to Nubs Nob Ski Area one long block away. We arrived Friday afternoon for a weekend getaway. The chalet was very nice and less than a mile from Nubs Nob. The only issue was not having TBS so we could watch NCAA basketball tournament last night so we improvised and watched it on my sons iPad. We would definitely stay here again. Very nice and clean chalet conveniently located in Hidden Hamlet. Dan was wonderful to work with and we had no problems with the home. Highly recommend this rental! The property was very comfortable. An easy place to relax after a day of skiing. The chalet was clean and well stocked. We would definitely consider staying there again. Thanks for the review. Come back again. For the last 18 years a group of my friends and I go skiing during Super Bowl week. We are all guys (now ranging fro 62 to 76 years young) so I look for a place that has enough individual beds to accommodate 6 to 8 people. Dan's Chalet has 4 bedrooms with 7 beds..6 twin (no bunk beds)and one queen. It's 1750 sq feet,so there is plenty of room for everyone...nice big living room/dining area as well as a loft where we comfortably watched the big game. The place was immaculate and well supplied with dishes, cookware, glasses, utensils, linens, towels and a gas grill. The most important thing is location, location! We were less than a 1/2 mile from Nub's Nob a mile and a half from Boyne Highlands. This made traveling to the slopes ( we skied both places) extremely easy. ....so if our aging bodies can manage another year of skiing,,,we will be back! Thanks for the nice review. Come back again. The chalet was clean and nicely equipped. The property was promptly shoveled and plowed each day. W.
The owner communicated clearly and promptly. The chalet was just as advertised. We loved the proximity to the mountains. Beautiful beaches, drives and sunsets nearby, and of course Downhill Skiing, Snowshoeing, sledding and more in winter! PLEASE NOTE: our rates vary considerably based on the time of year, length of stay, number of guests, and our cleaning people's schedules. AS A RESULT THE INSTANT QUOTE RATES MAY BE HIGHER AND OFTEN ARE LOWER. Also because our rates include cleaning and towels and linens the weekday and rentals of less than one week are usually higher than the computer generated rate. Also Note that while the CANCELLATION policy is 100% back if cancelled at least 60 days before arrival and 50% if cancelled 59-30 days before arrival, if we are able to re- rent the Chalet you will get a refund up to that amount of that rental -- less VRBO service fees etc. Smaller groups and families and mature adults preferred. A security deposit may be required for new guests, and discounts may be offered for long-term and near term rentals. This is not a typical rental property. Please email us for a quote. Thanks!